Did I mention Graham loves his preschool here in Los Angeles? He loves it. LOVES it. I think the fact that it indulges in "Crazy Hair Day" may be part of the reason. Also? Apparently most preschool moms consider a colorful barrette or a silly ponytail to be a suitable celebration of said Crazy Hair Day. Graham and I, we do not. That is some freaky, awesome hair! Great hair. What did you use? 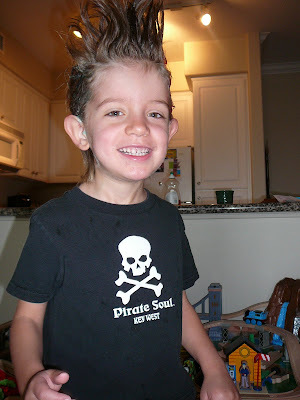 My boys love crazy hair day, too. Hello! Hello! Love his hair. Hope things are going well in LA!! He's already a SoCal boy! ha ha ha SO cute! Oh wow, I know it hasn't been long since you guys moved, but he's really growing up, isn't he? Oh my goodness! LOVE IT!!! My, he's growing up so fast!! Love the t-shirt he's sporting too! Awesome!! We did that with our son for Crazy Hair day here too. We Canadians know how to do it RIGHT!! He is absolutely too, too cool for rules :). So great to hear Los Angeles is working out for you and Graham. His hair looks great. Rock on, rocker! That's some kickin' hair! Hi there ! I am happy to read about you and it's great news that Graham loves his school in LA. Windy hugs from France !